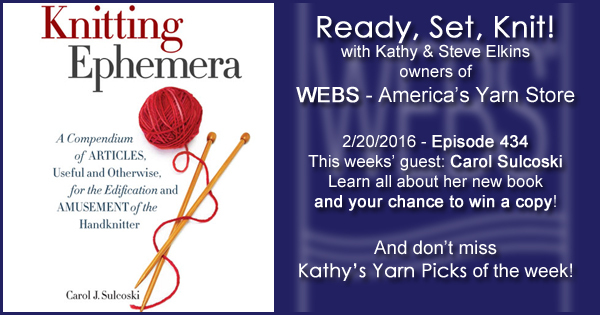 This week Kathy talks with Carol Sulcoski, author of the new book: Knitting Ephemera. Unlike Carol’s’ past books, full of knitting patterns and technical help, this is a collection of stories, anecdotes and knowledge of and from the knitting world. Share your own knitting ephemera and be entered to win a copy of Carol’s book! Leave a comment on this post with your own unique knitting trivia by 11;59pm EST on Tuesday Feb. 23rd. Please be sure to include a valid e-mail address in your comment so we can contact you if you win, and check next week’s post to see all the winners! Team WEBS is at STITCHES WEST this weekend, join us at the Santa Clara Convention Center in Santa Clara, CA. You can still get on the waitlist for our first ever WEBS Retreat in September. 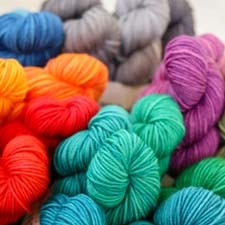 WEBS will be at DFW Fiber Fest April 1-3!